Promoter S.r.l. is a Ltd. company based in Pisa. It was founded in 1996 joining together competencies and experiences in the areas of information & communication technologies, research & development, multimedia innovation, business promotion and project management. Promoter’s general management and its staff is composed of skilled professional people who managed and participated to EU projects since the early 1990s, in different sectors belonging to several programs as Esprit, ACTS, eContent, eTen, CIP and RTD Framework Programmes FP5, FP6 and FP7. Software research and development, system design, technology transfer, academy/industry collaboration, business architecture, consultancy and project management – with wide experience on the management of EU projects – represent the main expertise of the company. Promoter is partner of prestigious cultural and research institutes as well as private enterprises in Europe providing expertise, know-how and technology within R&D cooperation projects. Main areas of the research are: ICT for cultural heritage and tourism, software systems and trusted multimedia web applications, adaptive services and interactive environments, metadata standards for representation of digital content, linked data and persistent identifiers, Content Management Systems (CMS) web design and development, Ontology Management and Semantic Web technologies. Other research activities are carried on in the area of the e-infrastructure enabled platforms for open science, development of e-Science Gateways to facilitate the access to computing and storage facilities (grid), management of identity federations to improve authorization and authentication mechanisms for virtual research communities. Promoter is a member of HarmoNET Association – the Harmonisation Network for the Exchange of Travel and Tourism Information (www.harmonet.org). HarmoNET is an international network bringing together people or organisations with an interest in the topic of harmonisation and seamless information exchange in travel and tourism. Promoter is a member of Michael Culture Association (www.michael-culture.eu), supporting European cultural heritage by supporting and valorising digitization and dissemination activities towards a European and worldwide audience. Promoter is also a member of the Advisory Board of Uncommon Culture (www.uncommonculture.org), a journal which provides unique perspectives on a rich variety of cultural activities in Europe. Promoter is a member of Polo di Innovazione ICT-Robotica (www.promoter.it/promoter-joined-at-polo-di-innovazione-ict-robotica), an initiative created under the supervisor of “Regione Toscana” with the participation of the Technological Center of Navacchio, all Tuscan universities, the Italian National Research Council, the “Scuola Superiore S. Anna” and several Service Centers of the various regional territories. Promoter is also a member of Polis – Polo delle Tecnologie per una Città Sostenibile, (http://www.polis-toscana.it/) an innovation cluster, promoted by a partnership of research organizations and service centers in Tuscany, that aggregates stakeholders for providing integrated services to the Tuscany SME’s in relation to energy, sustainable building, mobility and cultural heritage. 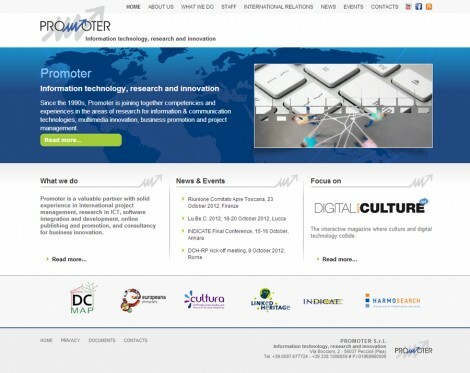 Finally, Promoter is the owner and manager of www.digitalmeetsculture.net, a communication and cooperation platform accounted as a remarkable meeting point for collecting and sharing information and events about digital culture.